I have loved this photo that I took of a crumbling bank while rafting the Snake River in Jackson Hole, Wyoming in 2006. The exposed strata of rocks, soil and roots above the clear running water intrigued me. And of course, I knew just how I wanted to portray it for the Interpret This challenge. But wait ... what I had in mind is what a lot of people would expect me to do. I like a challenge, plus participation in this group is pushing me to stretch beyond my comfort zone. Your work is beyond inspiring. Thank you for sharing. 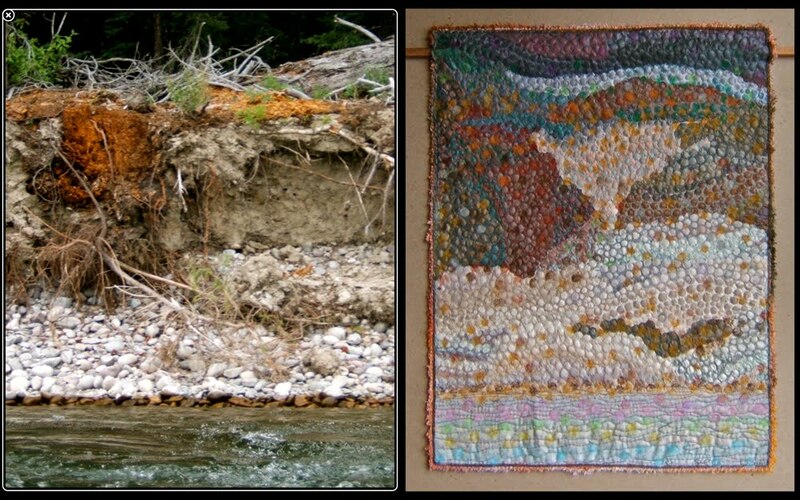 I love that photo of the crumbling river bank and your interpretation of it is stunning. It's such a clever idea to stick with the circles and unifies the whole design. I'm blown away! I can't interpret anything.